Sure, stocks in the Dow, S&P 500 and NASDAQ Composite all are trading near their all-time highs. 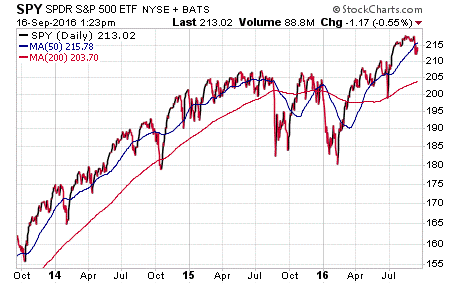 But despite the lofty values, you don’t really get the sense that stocks feel “bubble”-like. Indeed, we’ve been hearing for years now about a possible bubble bursting in the bond market, and in particular the U.S. Treasury bond market. The reason actually is quite simple, and it has a lot to do with central banks and interest rates. While the Federal Reserve, the European Central Bank and the Bank of Japan don’t directly control bond yields, each of these key central banks sets policies that make investors choose certain asset classes over others. It also has made bonds a virtual “growth” asset over the past several years, as capital appreciation has been great if you own bonds like those in the iShares 20+ Year Treasury Bond (TLT). That fund is up some 20% over the past five years, and that doesn’t include the yield. Yet as we told you last week, this time it could be different for bonds, as the Federal Reserve is looking as though it will hike interest rates at least once this year. While no rate hike is expected when the Federal Open Market Committee (FOMC) issues its statement on Wednesday, all market watchers will be looking to see if the Fed gives us any hints of a rate hike in December. Right now, the market is placing the odds of a December hike at about 50%. Such a hike likely would cause bond prices to fall and bond yields to rise, and that is what so many bond bubble theorists are afraid will trigger the beginning of an exodus from the bond market such that the bond prices will continue falling and bond yields will continue rising. That could cause a bursting of the bond bubble, and that’s the theory of a lot of really smart bond fund managers, including Jeffrey Gundlach of DoubleLine Capital. 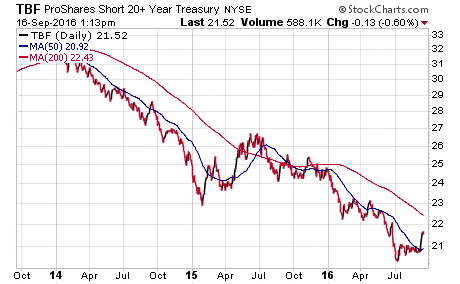 It is, however, good for inverse bond ETFs such as the ProShares Short 20+ Treasury (TBF). 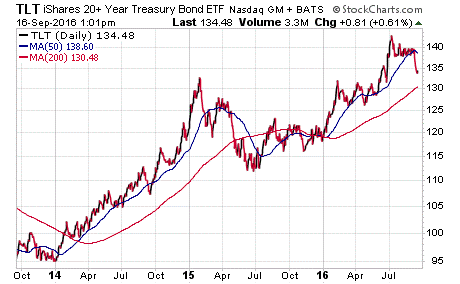 If the bond market does turn, we won’t hesitate to use funds like TBF to take advantage of falling bond prices. And while I am not ready to do that just yet, it is something that all prepared investors need to be familiar with, as the last thing you want is to be caught by surprise when an enormous bubble is bursting. If you want to make sure you’re ready for a potentially destructive bond bubble, then you need to click here to check out my Successful ETF Investing advisory service. Waiting any longer to be prepared is just inviting an ugly outcome. Our coverage of broad-based emerging markets exchange-traded funds (ETFs) today features another huge U.S.-based emerging markets fund, the iShares MSCI Emerging Markets Index (NYSE: EEM), with a whopping $30.6 billion in net assets. With money in more than 800 emerging-markets stocks, it is an understatement to say EEM’s portfolio is well diversified. The holding with the highest weight in the portfolio only makes up 3.77% of the fund’s investments, and all except nine holdings in the portfolio have weightings of less than 1%. This means two or three underperformers likely will have scant impact on the fund’s overall performance. EEM has had a terrific year in 2016, with a total cash inflow of more than $6.7 billion, a number exceeded by only four other ETFs in the world. Its year-to-date return is 13.17%, beating the S&P 500’s 4.66% return by a large margin. The chart below indicates a clear rise in the price of the fund in 2016, starting at $28 at the beginning of the year to its current price of around $37, a tremendous increase of 32%. If you are interested in gaining exposure to large- and mid-sized companies in emerging markets and simple access to over 800 emerging market stocks, consider iShares MSCI Emerging Markets Index (EEM). Comparing your achievements to those of others is a losing proposition. This is especially true when it comes to feelings of jealousy with respect to money. Don’t let yourself play the comparison game, as no matter how rich you are or how nice your life is, there will always be someone you’ll envy… and it’s no surprise that envy is considered one of the seven deadly sins. In case you missed it, I encourage you to read my e-letter column from last week about how Friday’s sell-off could indicate a turning point for your investments. This article, and many other past Weekly ETF Reports, can be found on StockInvestor.com, which is the new home of Eagle Daily Investor. I invite you to bookmark the site and follow it on Facebook and Twitter. An emerging markets fund is typically viewed as a volatile investment. However, this particular huge emerging markets fund offers diversification for your portfolio.